Good design is simple, reducing complex tasks to straightforward sequences of elegant interactions, making sure that there is no unnecessary step in the way. The big design challenge for the next version of iPlayer was how to create this simplicity in light of more features and functionality without overwhelming our audience. Let's consider the two basic tasks: find and play. The goal is to minimise our audience's time spent on the first task while maximising their time spent on the second one; ultimately discovery is just a means to enable people to watch their favourite show, which is why they come to the iPlayer in the first place. We recognised that watching TV and listening to the radio are two different activities that respond to different user needs. The previous version of iPlayer mixed radio and TV content on each page. However, user data showed that very few people used the iPlayer for both at the same time. Radio and TV iPlayer use peaked at different times of the day and had little overlap. (Table 1 most likely overstates the overlap as the number reflect hardware not users). In other words, very few people are indifferent to whether they watch TV or listen to the radio when they come to the iPlayer. This makes sense as watching TV and listening to radio are not perfect substitutes; TV is an immersive experience that tends to get the audience's undivided attention while listening to the radio tends to complement other activities and is a less immersive experience. People come to the iPlayer to either watch TV or listen to the radio. Therefore, we decided to make TV and radio the top navigational choice. The two pages, however, are identical in terms functionality and look and feel; it's only the content that differs. 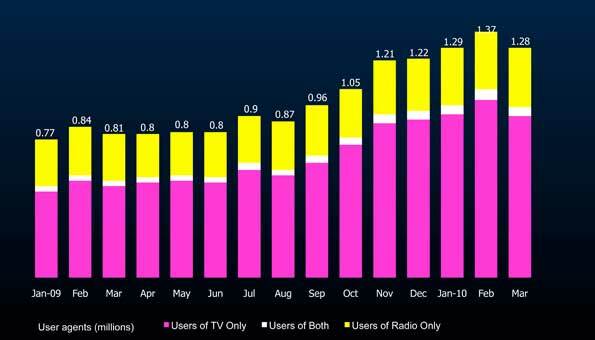 The TV page is the home page as more people come to the iPlayer to watch TV than listen to the radio. As a matter of fact TV and radio are the only two top navigational choices down from five in the previous version. This reduces V3 to three key pages: TV, Radio and media player. Fewer pages imply less navigation between pages and therefore less clicks to find content. The radical simplification of top-level navigation implies, however, that most of the navigation has to take place in context and in page which poses different challenges which will be discussed next. Collapsing Home, TV Channels, Radio Stations, Categories and A to Z into one page required us to rethink how content is accessed and bundled. Our design guidance came from considering the three primary discovery modes that we identified: browsing content, finding missed shows and exploring content of a certain type. The design of the TV and Radio page therefore consists of three parts that directly respond to the three user needs: the drawers on top of the page allows users to discover shows that they might not know about; the EPG on the lower left half of the page allows users to find what they missed; and the categories module on the lower right hand corner enables users to browse content by type. The drawers enable all scanning behaviours, combining four different sources for content discovery: Featured (editorially selected), For You, Most Popular and Friends. Each of them has a different flavour that might appeal to different users at different times. As it is impossible to know beforehand what might be of interest to the users, they can easily switch between the different sources. Upon arrival the drawers are partially open to reveal the available options. As soon as they interact with any of the drawers, the chosen one expands to show more content. As soon as another drawer is selected, the focus shifts accordingly. The drawers are a playful and efficient way to surface content, making the best use of the limited screen real estate. Earlier design treatments considered having four different modules, each containing one of the sources. However, it became clear that that solution would break the simplicity of the navigation. The EPG and the categories module, on the other hand, are more utilitarian by nature. The users know what they are looking for; the primary design challenge is to enable users to navigate the EPG or the categories and to get them to the searched item as quickly as possible. V3 personalisation features consist of For You, My Categories and Favourites. The different features are revealed over time as users engage with the content rather than all at once potentially overwhelming them. Favourites accompany the users throughout their iPlayer experience giving them universal access to their favourite shows at all times. Like a shopping cart it is pervasively accessible on top of the page connecting discovery - where shows are added - and watching - where they are consumed. My Categories are woven into the categories browsing module, in essence bookmarking the ones of interest to the users. Once users have chosen their favourite shows and categories and new content gets surfaced in the For You drawer, discovery requires less active engagement: users will always be only one click away from accessing their favourite BBC shows. Less time spent discovering means more time enjoying. The new carbon fibre look and feel of V3 replaced the shiny look of V2 while keeping the distinct and iconic black and pink of the iPlayer. The new "materiality" of the interface gives the interface depth and texture that adds dynamic to animated components such as the drawer. To underline the selected state in the top navigation a visual element inspired by the old radio dial was introduced while a streamlined font and color hierarchy was created to maintain a simple user interface. In a nutshell V3 offers new functionality in a new user interface that aims to make it easier for our audience to find what they want to watch or listen to. Streamlined navigation, new functionality and a new taxonomy will enable our audience to find more quicker giving them more time to enjoy the content. So what's next? We keep working to improve the experience with the goal to enable our audience to spend less time looking and more time enjoying on all platforms. The new iPlayer on mobile devices with Favourites launched recently and will soon launch on the other platforms as well. There is no new substance in the above, nor does it address many of the questions and criticisms made, and remaining unanswered, in the previous iPlayer beta blogs. To be fair to Fabian he wrote the original post some time ago but it's taken us a while to publish it on the blog for a variety of reasons. What are the questions that need answers? Will you be adding WebM/Silverlight/HTML5's h264 support for iplayer? Flash uses too much cpu and is jerky even on a core2 2ghz. Silverlight is perfectly smooth, so is WebM and so is native h264 with the video tag in HTML5. Please add support for atleast 1 of these as iplayer is just unusable on a 2ghz core2 laptop due to flash being jerky. Silverlight can cope with DRM, you could have silverlight and flash versions and allow the users to decide which to use. 1 If the presumption of iPlayer beta is based on such a strong distinction in consumption habit between TV and radio, why doesn't it default to the user's most recent choice? 2 Could you explain or defend why there are only "three primary discovery modes"? 3 Could you explain or defend why iPlayer beta's route to some programmes is longer than that of the non-beta? 4 Is it intentional that iPlayer will continue to offer programmes in the favourites' 'new' and 'expiring' lists that have already been watched/listened to by the user? 5 Why did the beta dispense with the per-channel programme lists? 6 Could you tell us whether any decision has been made about whether an iPlayer beta radio item will go straight to the console or through a programme page, or if we might get a choice about the matter. 7 Could you tell us whether we will have a choice between 'most recent' and 'A-Z' displays. Now we don't have the pop-ups for the Radio programmes, and the tooltips when you can't see the full programme name, I'm quite happy with the beta. I still would like the BBC Podcasts to be included as a "download" button (in exactly the same way as the TV programmes have one) within the iPlayer. Will the iPlayer beta site be switching to use the new GVL header prior to coming out of beta? Please ignore my question 6 - it's been overtaken by events. Is this version going to be rolled out on Playstation3? Why are there no HD streams available for Playstation3? After using the beta version of the site for a while I found myself going back to the old site. I found browsing by categories frustrating and too fine grained. The BBC already has a natural category breakdown of programs and that is by channel. By removing the ability to browse by channel in the new UI, I wasn't able to discover programs of interest as easily. I particularly miss being able to view all BBC HD programs in one place. James Hewines, head of iPlayer, has provided some answers to the questions you asked. You've probably seen them already but there are also three new posts today on iPlayer on the blog. @Russ / If the presumption of iPlayer beta is based on such a strong distinction in consumption habit between TV and radio, why doesn't it default to the user's most recent choice? We’ve already defaulted to the radio page for international users (because they can’t play TV programmes). We considered doing what you suggest during the design process but came to the conclusion that the greater good was served by consistent behaviour as opposed to it shifting in ways which may appear unpredictable to users of both TV and radio. One thing we are considering is the ability to select a preferred default. @Russ / Could you explain or defend why there are only "three primary discovery modes"? The homepage design aligns with these modes. There’s also the toolbar as well – “I know exactly what I want and I’m going to find it using the search box” and “I’d like to get at my favourite programmes quickly”. @Russ / Could you explain or defend why iPlayer beta's route to some programmes is longer than that of the non-beta? Respectfully we’ve worked hard to ensure that is not the case on balance. I’m sure you’ll appreciate design is a complex set of trade-offs and you can’t optimise for every possible journey at the same time as keeping things streamlined. We’ve worked hard during design and testing to ensure these result in shorter journeys for most of the people most of the time. @Russ / Is it intentional that iPlayer will continue to offer programmes in the favourites' 'new' and 'expiring' lists that have already been watched/listened to by the user? We’ve got a package of enhancements to the Favourites feature in the pipeline. One of these is a visual indication of the played programmes – we preferred this to hiding the programmes altogether when ‘watched’ as ‘watched’ meaning ‘never show me this again’ is difficult to define precisely. @Russ / Why did the beta dispense with the per-channel programme lists? @Russ / Could you tell us whether we will have a choice between 'most recent' and 'A-Z' displays. @cDavies2000 / By removing the ability to browse by channel in the new UI, I wasn't able to discover programs of interest as easily. I particularly miss being able to view all BBC HD programs in one place. What we’ve learned from users is that the main use case for the schedule is the time based view. When designing the schedule pages we were conscious of the need to keep the number of facets at the top of the page manageable and to get users to the most current content with least clicks. We’re considering other ways we might address the need you’ve articulated, perhaps by enhancing the sidebar ‘most popular’ functionality with the ability to access full channel listings. @Briantist / I still would like the BBC Podcasts to be included as a "download" button (in exactly the same way as the TV programmes have one) within the iPlayer. So would we - we have exactly this in our plans, but it needs to be joined-up with some media publishing changes by our radio colleagues. It’s one of those things that’s a little harder than it looks. @Keith / Will the iPlayer beta site be switching to use the new GVL header prior to coming out of beta? Not quite yet, but very soon. @Zubeirp / Is this version going to be rolled out on Playstation3? Why are there no HD streams available for Playstation3? We’re not quite ready to confirm anything specific just yet, but in generally we’re working hard to evolve iPlayer across the various platforms to deliver a consistent set of identity and capabilities. Of course, the specific design for TV devices like PS3 will always be optimised to take account of use context, screen size, control device etc, so we won’t be rolling out the main site as it stands. On HD, it may surprise you to hear that we’re currently hitting some technical constraints preventing HD playback, but are exploring ways we might address these. re #11 "three discovery modes"
Do you mean no-one uses the A-Z to find, say, Top Gear or Dragons' Den without having to know which channel it was on and when? Will the new BBC iPlayer work on a Mac running OSX Tiger? One of my complaints in the past has been the fact that the current iPlayer wasn't made backwardly compatible to run on Panther: I have just purchased a copy of Tiger in order to be able to run on my G4 PPC machine. regarding the per-channel programme lists, I don't see why you couldn't add in the Categories module an aditional group to include this. So far you have 4 groups in the Categories module, where each group sorts the programmes according to some attribute (i.e. genre, location, etc) The groups are:"My Categories, All Categories, Signed,Regional". You could have easily added an extra "Channels" group in there, where the programmes are sorted by channel. Do you have any comments on this? Having read most of the discussion here I can see that you're redesigning for the majority based on your 'stats' but I'd suggest than none of us would regard ourselves as part of that majority. The fundamental problem for me with the new layout (apart from the registration required) is that like 4OD if you want to watch something you need to know what it is that you want to watch. By that I mean your justification for the removal of current categories is that users can still find things quickly if the search by name. All well and good but you can only search for what you know. I don't use 4OD because I can't find anything interesting and don't have the determination to scroll lists and lists of hundreds of programmes to find something interesting. The new system may be fine if you watch TV anyway and see the trails for up and coming programmes. If you don't have a TV (and we don't) you never see any trails or 'ads' for up and coming programmes. You can't search for what you don't know exists. A default to 'most popular' and 'most viewed' seems to be the worst possible way to find what's new on the BBC. The Most Popular on other video sites amounts to a whole load of shallow rubbish, there's more to BBC than Top Gear. I'm disappointed that it is no longer possible to filter by station (Radio 4) and category (Comedy). I would like to change back to the old version of I-Player, how caan I do this? As one of the people that didn't differentiate between radio and tv when searching, it is nice to know that as a licence payer my views have been immediately discounted, because I am in a minority. Open Categories, in seperate tabs open Comedy, Drama, Films. Scroll through each (viewing TV and Radio), sometimes in A-Z sometimes in most recently, open a selection of programs in tabs and then work my way through the tabs, listening or watching all. Would you care to hazard a guess at how many steps I now have to go through to 'enjoy' the use of this service I pay for? Friends? Exactly which of my friends have you emailed, or phoned to see which programs they are liking? These people are not my friends. For You? Eastenders, are you serious? I believe it has been at least 5 years since I watched a soap, then it was only because my ex "had to watch her corrie". What spurious information are you basing For You on? It certainly isn't my viewing or listening habits. Featured? Another section I have no interest in, but can I remove it, no, apparently I am not to be trusted with the common sense to be able to find programs I want on my own. Most Popular, now that I used to use, and I loved it when it was a very small list unobtrusively on the right hand side. Of course, none of my opinions count do they... as you have already discounted me as a user whose opinions matter. i find downloads on the PC desktop are still not working properly despite being fine all through the beta. did a clean install; still erratic. basically the app hangs and refuses to download content. all the material i had saved under the beta was also deleted w/o warning on taking the update. Could you please add an ever so simple feature back? Where is the content slider? In your first response to all this you noted that one of the main usage models was effrectively category based 'i want to watch something funny'. You have now made it more difficult, or at least off putting, to users by removing the slider feature that used to work on category views. Instead, we can view the curated top 3 links, or trawl through multiple pages of links to other programmes. This also involves vertical scrolling. This isn't a particularly laborious task, but it is a regression from the wonderfully easy method of clicking category (I want to watch something funny) then clicking the back and forth arrows and watching different programmes slide past. Why remove this? I appreciate, that more and more internet sites feel the need to curate, to hold the users hand in response to overwhelming amounts of information. You have actually done it in a very good way with favourites and (I presume) predictive suggestions. All that doesn't change the fact that sometimes users want the full thing, the entire catalogue. A-Z, full category content (WITHOUT having to reload the page several times or scrolling), even channel selection, they must all be incredibly easy to do presuming you have a database with the relevant meta-information. I know your BBC redux and related in-house players use them. Why remove it for end-users? Why do we HAVE to take the curated view and not have the option to see it all? You had an option of taking the old system's full catalogue and the new system's innovative organisation and instead copped out. No doubt you will attribute it to resilience to adjustment, but what you will almost certainly not admit is that you have removed features that people liked for no reason other than to force a new model on them. Give us both. So as far as I can ascertain from your comments and answers given above, the design team deliberately went out of its way to reduce the experience of viewing to numerical analysis of an average viewer. Can I suggest that the average viewer is not a beta-tester or an early adopter and that a true reflection of usability is found in the large numbers of complaints on these many threads. Yes, people are reacting to change, but if the change is good the negative reactions should have faded somewhat by now. Instead you have loyal viewers, I consider myself one, who have reached wits end. When BMW launches a new model they build one and let normal folks walk around it and react to it in a visceral way. They ask what people feel about it not whether the torque is high enough (something you can't know from a mock-up). On the basis of what people feel the design of the body goes forward or not. Most people don't give a stuff about technical detail. When we watch a crocodile leap out at a wilderbeast in the Seregenti we don't think "Oh, I wonder how the adaptive bit rate management system coped with that". We just marvel at the clarity and the drama. Or at least we did. You have done entirely the wrong kind of testing for this product. This is not a technical product. This is a product that has technical aspects, as does tomato ketchup, but it is primarily the visceral experience of using, tasting, viewing that makes it a success or failure. The new iPlayer is a failure right now. Back to beta with it, it is unbearable. It is like using a tiny phone interface to find a mass of content. Unbelievable. Is it some bizzare tactic to save on bandwidth? Look at your statistics now, how many people are using the new one, more than before? I so very much doubt it. Have just returned from 3 weeks in China to catch up on all those good BBC programmes I've missed since I've been away. My partner and I couldn't understand why we couldn't find anything meaningful or useful on iPlayer and it took a while to realise iPlayer has been upgraded. What a true waste of license payers money the latest upgrade is. Useless to use, useless to find previously broadcast programmes, totally channel and not programme centric. iPlayer represents the BBC's own organisation and internal divisions(!) and is not viewer centric at all. Seems more like an exercise in self-interest rather than a considered good value project with the viewer in mind. iPlayer now concentrates on today's schedule and programmes - somebody ought to tell the BBC I can see all that on a modern piece of technology, called a Skybox and TV - and that the reason i visit the iPlayer website is to catch up on the things I've missed, not the things I want to watch now...!!! This iPlayer looks incredible. It's surely the single best product I've seen in a while. A fellow next to me on a recent plane ride had something similar - what an awesome spectacle. I've seen many comments posted here that are largely negative towards the iPlayer - I've not yet seen its downside - but I'll give it the benefit of the doubt. "I've seen many comments posted here that are largely negative towards the iPlayer - I've not yet seen its downside"
How about downloaded programmes being deleted weeks before they are due to expire? Despite painstakingly testing and pointing out the flaw in their programming logic to the iPlayer Development Team, they flatly refuse to fix it (or are completely incapable of doing so), even though there are solutions available. This particular BUG dates back to spring 2010, pre-beta! Looking incredible is one thing. However, the iPlayer v3 is functionally more difficult to use, with much longer click paths, and takes up far more resources than is user-friendly (by charter, the BBC target audience is not the same as ITV or Channel 4), combined with long-standing BUGs! No, the new version is unacceptable in its current condition and should be recalled. There should be no plans to take this fiasco global. That kind of thinking is bewilderingly delusional and should be stopped before it is too late!